Mini Blenders among other types of equipment have their own unique advantages. For this reason, on the market you can find a lot of models, differing in size, accessories and price. Some models are better at grinding or have a broader functionality. We offer powerful and reliable mini blenders at a reasonable price. They cope well with different tasks, primarily preparing smoothies, green cocktails and soft drinks. With additional accessories a personal blender is able to chop vegetables, grind dry products and even knead dough. The most important and obvious advantage of a personal blender is it size. Occupying an upright position, these devices do not require a lot of space. Their base is so narrow that you can place such a device anywhere. It is convenient to leave the blender right on the kitchen counter, without disassembling it for storage. Unlike traditional blenders, food processors and coffee grinders, they really do not take up much space, but can successfully replace all of the above items. Universal models with a set of knives and cups allow to cook more than just smoothies. It is convenient to grind spices, coffee beans, grains, particularly in small quantities. For chopping vegetables for salad or kneading dough you can use the same device. Most often people use mini-blender for baby food, drinks, cream soups, sauces and dressings. When using modern food-grade plastic, natural taste and smell of foods remains natural. RawMID.com presents products only from high-quality and safe materials. Health care is above everything else. 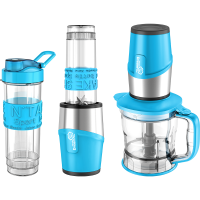 Personal blenders have a very simple design and are controlled by one or rarely more buttons. Assembling and disassembling takes a few seconds, operation is simple. Everyone will find many advantages in a small, but capable assistant, that helps to eat more healthy everyday. Despite the size, these devices are powerful enough: they can crush ice, hard vegetables and dry foods. The rotation speed of the blades may reach 20 000 rpm. When working, they are much more quiet, than professional blenders due to a less powerful engine, and, respectively, consume less energy. A personal blender needs minimal care, which consists of simply rinsing the device after use. It is recommended to clean it immediately after use: after some time food residues become harden and more difficult to remove. The jar can be washed in a dishwasher or under tap water. It is prohibited to immerse body in the water, cleaning is done with a dry or damp cloth. There are some precautions described in the User's Guide. For example, you should check the condition of the network cable and other components of a mini-blender: in case if defects are present, parts should be replaced in a service center. However, with proper use, the occurrence of breakage is unlikely. It is recommended to protect the device from direct sunlight and high humidity, to keep it away from sources of heat and cold. Despite its small size, it is necessary to keep the blender in a place, not accessible for children, because its knives can be dangerous. Select a jar and a knife, according to the function performed (big jar for smoothies, small cups for dry grinding). Put the right amount of ingredients, not overfilling the jar (the recommended amount for products can be found in the instructions). Set the jar on blenders base and turn to lock (if the jar is not fixed, blender will not start to work). Start grinding by selecting a speed. Blend ingredients until the desired consistency is reached, but not more than 30 seconds at a time (generally, no more than 20 seconds is required for any task). Consume the obtained product immediately or store it for later consumption (covers for cups are included, as well as a sports bottle). Rinse the necessary parts, leave the blenders jar open to dry. This is the fastest way to make a drink for one or two person and will take just a few minutes. Hint: slice hard fruits and vegetables into small pieces before placing in a jar. This gives a more uniform consistency and a more pleasant feeling while drinking. More affordable, small and convenient, these models are perfect for personal use. Unlike the professional appliances, jar capacity is average 500-700 ml (against 2 liters capacity of PRO Blenders from RawMID). Most raw recipes can be prepared in a mini-blender, even if they contain seeds, nuts and spices. This is possible due to the special blades that can grind dry foods. Of course, no mini-blender can compete in a perfect smoothie consistency with a professional model of 4 HP. However, a personal blender allows to prepare a simple smoothie for one or two people more easier and faster. If you are looking for such a model, be sure to buy a Mini-Blender in our online store. Dream Mini Blender is available at an affordable price, with worldwide shipping. For more detailed information please visit the product`s page. 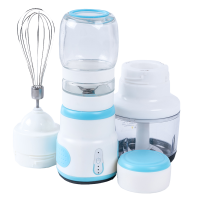 Dream Mini Blender BDM-07 is a small, but efficient model. Includes four containers with separate knives for different functions. With Dream Mini Blender you can be prepare beverages, semi-liquid foods and grind dry products (spices, nuts, coffee). 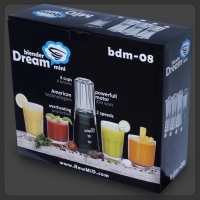 Although the model is not as powerful and c..
Dream Mini Blender BDM-08 is a small, but efficient model. Includes four containers with separate knives for different functions. With Dream Mini Blender you can be prepare beverages, semi-liquid foods and grind dry products (spices, nuts, coffee). Although the model is not as powerful and capaci..